In the last few decades scientific studies have revealed that how much we eat and what we eat is controlled not only by our own desires, but also is regulated physiologically and influenced by genetics. 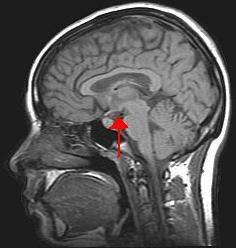 The hypothalamus in the brain is the main control point of appetite. It receives hormonal and neural signals, which determine if you feel hungry or full. 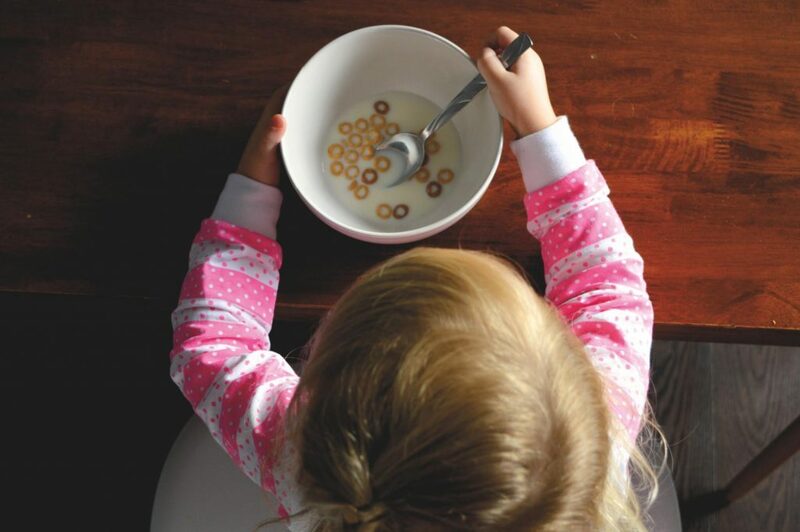 Hunger is an unpleasant sensation of feeling empty that is communicated to the brain by both mechanical and chemical signals from the periphery. Conversely, satiety is the sensation of feeling full and it also is determined by mechanical and chemical signals relayed from the periphery. The hypothalamus contains distinct centers of neural circuits that regulate hunger and satiety (Figure 8.7). This is a scan of a brain. The hypothalamus contains distinct centers of neural circuits that regulate hunger and satiety. Hunger pangs are real and so is a “growling” stomach. When the stomach is empty it contracts, producing the characteristic pang and “growl.” The stomach’s mechanical movements relay neural signals to the hypothalamus, which relays other neural signals to parts of the brain. This results in the conscious feeling of the need to eat. Alternatively, after you eat a meal the stomach stretches and sends a neural signal to the brain stimulating the sensation of satiety and relaying the message to stop eating. The stomach also sends out certain hormones when it is full and others when it is empty. These hormones communicate to the hypothalamus and other areas of the brain either to stop eating or to find some food. Fat tissue also plays a role in regulating food intake. Fat tissue produces the hormone leptin, which communicates to the satiety center in the hypothalamus that the body is in positive energy balance. The discovery of leptin’s functions sparked a craze in the research world and the diet pill industry, as it was hypothesized that if you give leptin to a person who is overweight, they will decrease their food intake. Alas, this is not the case. In several clinical trials it was found that people who are overweight or obese are actually resistant to the hormone, meaning their brain does not respond as well to it. Therefore, when you administer leptin to an overweight or obese person there is no sustained effect on food intake. Nutrients themselves also play a role in influencing food intake. The hypothalamus senses nutrient levels in the blood. When they are low the hunger center is stimulated, and when they are high the satiety center is stimulated. Furthermore, cravings for salty and sweet foods have an underlying physiological basis. Both undernutrition and overnutrition affect hormone levels and the neural circuitry controlling appetite, which makes losing or gaining weight a substantial physiological hurdle. Genetics certainly play a role in body fatness and weight and also affects food intake. Children who have been adopted typically are similar in weight and body fatness to their biological parents. Moreover, identical twins are twice as likely to be of similar weights as compared to fraternal twins. The scientific search for obesity genes is ongoing and a few have been identified, such as the gene that encodes for leptin. However, overweight and obesity that manifests in millions of people is not likely to be attributed to one or even a few genes, but the interactions of hundreds of genes with the environment. In fact, when an individual has a mutated version of the gene coding for leptin, they are obese, but only a few dozen people around the world have been identified as having a completely defective leptin gene. When your mouth waters in response to the smell of a roasting Thanksgiving turkey and steaming hot pies, you are experiencing a psychological influence on food intake. A person’s perception of good-smelling and good-tasting food influences what they eat and how much they eat. Mood and emotions are associated with food intake. Depression, low self-esteem, compulsive disorders, and emotional trauma are sometimes linked with increased food intake and obesity. Certain behaviors can be predictive of how much a person eats. Some of these are how much food a person heaps onto their plate, how often they snack on calorie-dense, salty foods, how often they watch television or sit at a computer, and how often they eat out. A study published in a 2008 issue of Obesity looked at characteristics of Chinese buffet patrons. The study found that those who chose to immediately eat before browsing the buffet used larger plates, used a fork rather than chopsticks, chewed less per bite of food, and had higher BMIs than patrons who did not exhibit these behaviors. Of course many behaviors are reflective of what we have easy access to—a concept we will discuss next. It is without a doubt that the American society affects what and how much we eat. Portion sizes have increased dramatically in the past few decades. For example, a bagel is now more than twice the size it was in the 1960s. Today, American teenagers have access to a massive amount of calorie-dense foods and beverages, which is a large contributor to the recent rapid increase in overweight and obesity in adolescents in this country. Even different cultures within the United States have different eating habits. For instance, Native Hawaiians and Pacific Islanders who have since adopted the western diet, post-colonization consume foods high in fat, which is a contributing factor to their higher incidences of overweight and obesity. The fast food industry in America not only supplies Americans with a large proportion of their diet, but because of its massive presence in society dominates the workings of the entire food system. To generalize, most fast food items have little nutritional merit as they are highly processed and rich in saturated fat, salt, and added sugars. Despite fast foods being a poor source of nourishment, Americans spend over one hundred billion dollars per year on fast food, up from six billion dollars in the early 1970s. The fast food business is likely to continue to grow in North America (and the rest of the world) and greatly affect the diets of whole populations. Because it is unrealistic to say that Americans should abruptly quit eating fast food to save their health (because they will not) society needs to come up with ideas that push nutrient-dense whole foods into the fast food industry. You may have observed that this largely consumer-driven push is having some effect on the foods the fast food industry serves (just watch a recent Subway commercial, or check the options now available in a McDonald’s Happy Meal). Pushing the fast food industry to serve healthier foods is a realistic and positive way to improve the American diet. Support the consumer movement of pushing the fast food industry and your favorite local restaurants into serving more nutrient-dense foods. You can begin this task by starting simple, such as requesting extra tomatoes and lettuce on your burger and more nutrient-dense choices in the salad bar. Also, choose their low-calorie menu options and help support the emerging market of healthier choices in the fast food industry. In today’s fast-paced society, it is difficult for most people to avoid fast food all the time. When you do need a quick bite on the run, choose the fast food restaurants that serve healthier foods. Also, start asking for caloric contents of foods so that the restaurant becomes more aware that their patrons are being calorie conscious. Factors Affecting Energy Intake by University of Hawai’i at Mānoa Food Science and Human Nutrition Program is licensed under a Creative Commons Attribution-NonCommercial-ShareAlike 4.0 International License, except where otherwise noted.